Home > Resources > Dr. Sears' Blog > What Is the Ketogenic Diet and How Does It Compare to the Zone Diet? Over the past few months we’ve received a number of inquiries regarding Dr. Sears’ stance on the Ketogenic Diet and how it relates to the Zone in terms of health and weight loss. Is this just the next diet craze or is it as good for weight loss and health as it’s touted to be? The ketogenic diet is a high-fat, low carbohydrate diet consisting of approximately 75% fat, 20% protein and 5% carbohydrate. Compare this to the Zone which is moderate in these macronutrients and supplies 30% fat, 30% protein and 40% carbohydrate as total dietary calories. The Ketogenic Diet is based on getting the body into a state of ketosis (hence “keto”). Ketosis is a back-up metabolic system used to provide the brain with an energy source, called ketones, if glucose isn’t available or if blood levels fall too low. The popularity in the Ketogenic Diet stems from the quick weight loss it produces and its perceived health benefits. The diet is thought to increase the body’s ability to burn stored body fat and lower insulin levels. It’s important to note that the weight loss that stems from this diet isn’t necessarily fat loss, despite fat being the preferred/primary fuel on this eating plan. In general, when we lose weight, it results from one of three factors: the loss of retained water, loss of muscle mass or loss of stored body fat. The ideal scenario would be to lose stored body fat. Ketogenic diets can promote an initial loss of retained water that comes with the depletion of glycogen (storage form of glucose). This is because stored glycogen retains significant levels of water. As the glycogen levels are reduced (due to limited carbohydrates in the diet), the retained water associated with that stored glycogen is also rapidly lost through increased urination. Although the loss of weight on a scale can be considerable in the first few days of a ketogenic diet, it will result in little loss of stored body fat. The loss of stored body fat only comes with significant calorie restriction as the body has many biological processes that help us to preserve it. Ketogenic diets are high in fat, which means the blood levels of fat will also be increased. As the availability of glucose in the blood decreases and the availability of fat increases, the metabolic flexibility (inherent in muscle cells) switches to using circulating fat as the preferred source of fuel for energy production (a.k.a. ATP), instead of glucose. This leads to the misconception that by getting into a state of ketosis you burn stored body fat. Instead, it is that the higher levels of dietary fat entering the blood stream are now becoming the preferred source of energy. Furthermore, a ketogenic diet being low in carbohydrates lowers insulin levels so less of that circulating fat can be stored in adipose tissue for long-term storage. Protein can also increase insulin levels resulting in circulating fat being transported into the adipose tissue for storage. This is why eating a high-fat diet containing excess calories, but with adequate levels of protein would not result in any fat loss, even though the carbohydrate content of such a diet can be very low. What is known from clinical studies is that significant hormonal changes take place on ketogenic diets and it’s not necessarily for the better. Here is a snap shot of the hormones impacted when following the diet long-term. Since the ketogenic diet is limited in carbohydrates, it will not supply enough fermentable fiber for gut health. This lack of fermentable fiber will reduce the production of short-chain fatty acids (SCFA) that are required for maintaining the integrity of the mucus barrier and tight junction of the mucosa as well as increasing the production of T-regulatory cells. The end result is a greater likelihood of metabolic endotoxemia which can lead to weight regain. Stimulation of protein synthesis requires the combination of insulin (to drive amino acids into the muscle cell) and testosterone (to activate the receptors that signal for the stimulation of new muscle formation. Both hormones are decreased in ketogenic diets thus making it difficult to maintain muscle mass. 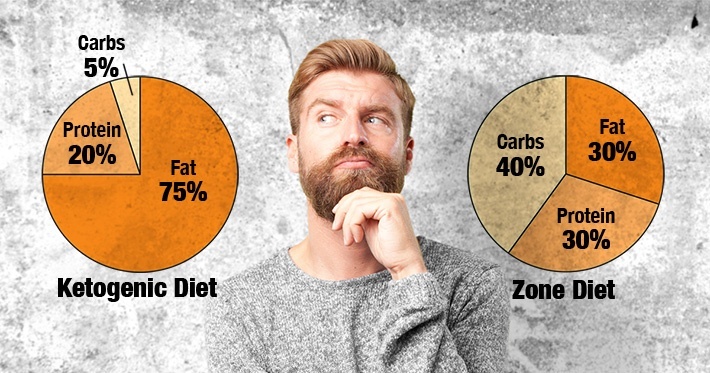 A few years back, we set out to test how the Zone Diet compared to a Ketogenic Diet. This study kept both the protein and total calorie intake constant between a ketogenic diet and the non-ketogenic Zone Diet10. It controlled the diet for the first six weeks by supplying all the food to the subjects. These were calorie restricted diets (1,500 calories per day) to ensure that there was a sufficient calorie deficit to determine the effect of the two diets on loss of stored body fat, which can be only be achieved if a calorie deficient is maintained for long enough period of time. In the first three weeks of the study, the weight loss of the non-ketogenic Zone Diet and the ketogenic were essentially the same. However, in the second three-week period, the weight loss on the non-ketogenic Zone diet was greater than compared to the ketogenic diet. The same was true for fat loss. Even though it was a calorie restricted diet, there was no change in the fat-free (i.e. muscle mass) mass of either group during the six-week period indicating that the protein intake (which was equal in both diets) was sufficient to spare the loss of muscle mass. The AA/EPA ratio in the blood is indicative of inflammation. On the ketogenic diet, this inflammatory marker doubled during the six-week period of the study, whereas there was slight lowering on the non-ketogenic Zone Diet. Furthermore, mental state and exercise capacity of the subjects following the non-ketogenic Zone Diet improved during the study when compared to the subjects following the ketogenic diet. This study presented evidence that there were no advantages of a ketogenic diet compared to one with equal protein, calories, and higher carbohydrate and lower fat content such as the Zone Diet. In addition, the study suggested that a ketogenic diet significantly increases inflammation in a relatively short period of time compared to non-ketogenic Zone Diet. Although initial weight loss (but not necessarily fat loss) on a ketogenic diet may be higher compared to a non-ketogenic diet, there are no long-term differences in overall weight loss. This may be due to the changes in hormonal responses induced by a ketogenic diet. Furthermore, the hormonal and inflammatory changes induced by a ketogenic diet may have significant adverse health consequences as suggested in epidemiological studies. Fat loss is only achieved by calorie restriction and can be maintained only if the diet used is one that is without hunger or fatigue so that the fat loss can be maintained for a lifetime. This can be achieved by a calorie-restricted diet that is adequate in protein to prevent the loss of lean muscle mass, supplies adequate levels of carbohydrates to reduce the generation of ketone bodies and promote gut health, maintains adequate levels of blood glucose for the brain, and finally contains a low level of dietary fat to encourage the use of stored fat for energy by the rest of the body. That’s the promise of the Zone Diet. Anderson KE, Rosner W, Khan MS, New MI, Pang SY, Wissel PS, and Kappas A. “Diet-hormone interactions: protein/carbohydrate ratio alters reciprocally the plasma levels of testosterone and cortisol and their respective binding globulins in man.” Life Sci. 1987 40:1761-1788. Lane AR, Duke JW, and Hackney AC. “Influence of dietary carbohydrate intake on the free testosterone: cortisol ratio responses to short-term intensive exercise training.” Eur J Appl Physiol 2010 108:1125-1131. Sephton SE, Dhabhar FS, Keuroghlian AS, Giese-Davis J, McEwen BS, Ionan AC, and Spiegel D. “Depression, cortisol, and suppressed cell-mediated immunity in metastatic breast cancer.” Brain Behav Immun 2009 23:1148-1155. White AM, Johnston CS, Swan PD, Tjonn SL, and Sears B. “Blood ketones are directly related to fatigue and perceived effort during exercise in overweight adults adhering to low-carbohydrate diets for weight loss: a pilot study.” J Am Diet Assoc. 2007 107:1792-1796. Duncan SH, Belenguer A, Holtrop G, Johnstone AM, Flint HJ, and Lobley GE. “Reduced dietary intake of carbohydrates by obese subjects results in decreased concentrations of butyrate and butyrate-producing bacteria in feces.” Appl Environ Microbiol 2007 73:1073-1078. Cani PD, Amar J, Iglesias MA, Poggi M, Knauf C, Bastelica D, Neyrinck AM, Fava F, Tuohy KM, Chabo C, Waget A, Delmée E, Cousin B, Sulpice T, Chamontin B, Ferrières J, Tanti JF, Gibson GR, Casteilla L, Delzenne NM, Alessi MC, and Burcelin R. “Metabolic endotoxemia initiates obesity and insulin resistance.” Diabetes. 2007 56:1761-1772. Fujita S, Rasmussen BB, Cadenas JG, Grady JJ, and Volpi E. “Effect of insulin on human skeletal muscle protein synthesis is modulated by insulin-induced changes in muscle blood flow and amino acid availability.” Am J Physiol Endocrinol Metab 2006 291: E745–E754. Johnston CS, Tjonn SL, Swan PD, White A, Hutchins H, and Sears B. “Ketogenic low-carbohydrate diets have no metabolic advantage over nonketogenic low-carbohydrate diets.” Am J Clin Nutr 2006 83:1055-61.